The IC Bruisers is part of a 501(c)3 non-profit umbrella, Iowa R.E.A.C.H. (Respect. Empowerment. Athleticism. Community. Health.) Iowa R.E.A.C.H. 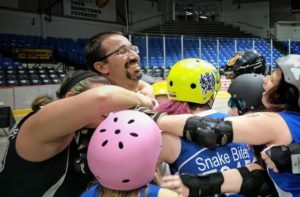 owns IC Bruisers, as well as several teams currently being developed for both adults and children throughout Eastern Iowa. IC Bruisers was founded in June 2014 by Brian and Veronica Ferreira. 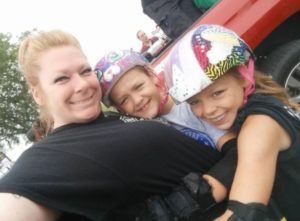 They wanted to create a safe, inclusive, healthy activity for their children, three of whom still skate for IC Bruisers. Brian is a medical instrumentologist at the VA hospital in Iowa City, and Veronica earned her PhD in sociology, with an emphasis on small group interaction in sports settings, from the University of Iowa, and now teaches part time at colleges/universities throughout the area. The Ferreiras were pleasantly surprised to discover how many families in the Iowa City/Coralville area were like theirs, just looking for a place where their child can grow and learn…and belong. We aim to foster a safe, inclusive environment for people of all ages, sexual orientations, race/ethnicities, genders, religious preferences, and economic statuses. We welcome individuals with a variety of learning and neurological conditions, and we work to accommodate those with unique challenges wherever we can. We teach roller derby, and in the process, we aim to instill healthy self-body images, a commitment to health and the community. We develop leadership and teamwork skills. An important component of our program is that it is free to participate. We never want any child to not be able to participate due to financial concerns. All safety gear, skates, and uniforms are provided free of charge. We simply ask that as gear and skates are outgrown, they be donated back to IC Bruisers so we can give them to another child. Beezer is the Director of Training and Coaching, and Co-founder. He is also one of two head coaches for the Bruise Misfits, our level 3 team. Beezer oversees all coaching and rostering, and maintains the equipment for the league. When needed, he also serves as one of our medics, and maintains our medical supply kits for practices and games. He was also trained as a referee, and can be seen travelling to referee for other teams, but rarely referees for ICB. As a board member, Beezer votes on policy changes and disciplinary action as needed. Paperwork is co-founder and Director of Human Resources. She maintains all records of skaters and volunteers, including emergency contact information and skating. She is responsible for overseeing volunteers in the program. In addition, she can be seen occasionally working as an NSO, but rarely for ICB. She helps in the training of NSOs for ICB as needed. She also oversees gifts from ICB, such as treat bags for volunteers and sympathy bags for skaters who experience a loss or are injured during participation in ICB. As a board member, Paperwork also helps organize and facilitate fundraising events, votes on policy changes and disciplinary action as needed. Kayte is our Director of Event Productions. She oversees venue setup, and collaborates with vendors and other board members to ensure that public events, including games and publicity appearances, are run smoothly. Like other board members, she also helps organize and facilitate fundraising events, votes on policy changes and disciplinary actions as they arise. She coordinates the actions of the Event Productions Committee. Kayte is also the mother of Bruise Misfits skater Diamond, Black-Hearted Bruiser skater Diva, and Bug Bite skater Dynamite. Stacie is our Public Relations & Communications Director. 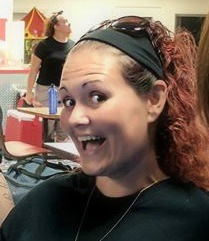 She helps promote the IC Bruisers and their events via marketing, social media and word of mouth. She communicates with the media, community and the parents of skaters on the team. She is an Iowa native, starving artist, mother of four (one is an IC Bruiser – Agent Orange), champion of women, and an activist of people. As a board member, she handles the majority of league communications, helps organize and facilitate fundraising events, votes on policy changes and disciplinary actions as they arise. Becky Boscaljon/Anna Lytical. Anna is our NSO Liaison. She oversees training and staffing of NSOs for all ICB home games. She is also mother to Black-Hearted Bruiser skater Hermione Danger. Joan Williams/Coach Killer Baker. 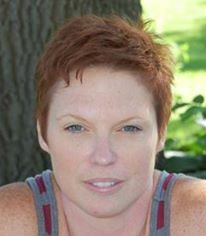 Joan is co-head coach of the Bruise Misfits, our level 3 team. 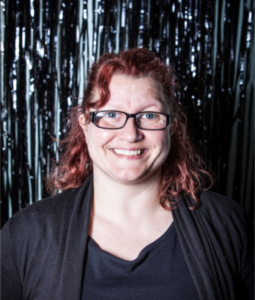 Along with Beezer, she oversees training of all level 3 skaters, and develops game rosters for the Bruise Misfits. Melissa Gregory/G Ruffe. G Ruffe is a coach of the Bug Bites, our beginner-level skaters. She oversees training of all new skaters, and helps them feel like welcome new members of ICB. Cowboy. Our Head of Officiating. Responsible for recruitment and training of all referees, and oversight of NSO training. Nick Hippert/Nacho Daddy. Nacho Daddy serves as our DJ for all ICB home games. He also coordinates the local acts that volunteer to serve as entertainment for our home games, and assists with coordination of our fundraisers. Bad Daditude. Bad Daditude helps coach our Bug Bites. He is also parent to skater Crimson Kupa and Jammy Whammy. Walking Dad. Walking Dad coaches our Blackhearted Bruisers. He is also parent to skater Collide A Scope and non-skating official Pocket Lesbian. Mama Rx. Mama Rx is one of our medics. She is also parent to skaters Mad Hatter and Mary Floppins. OPM. OPM is parent to Axolotl Supreme, and our resident videographer. Para Dox. Chief Medic for our public events. Bear Trap. Bear Trap is a former board member, occasional coach, and long-time NSO. Papa Hit. Papa Hit helps coach our Bug Bites and is a referee. He is also parent to skater Lil Hit. Madam Scary. A former skater-turned coach, Madam Scary is one of our longest-tenured volunteers, despite also being our youngest. Mama Merch. Mama Merch usually runs our merchandise table during public events. She is also mother to coach/skater Dark Leopard. There are dozens of volunteers not listed here. Every practice depends on the generously-donated labor of at least 10-12 adults, and a home game requires 40-50 volunteers! No one at Iowa R.E.A.C.H. receives a salary, so volunteers are our most valuable asset!